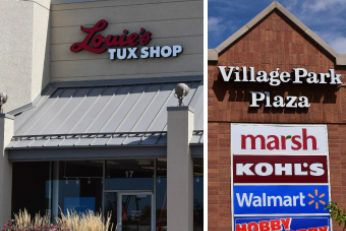 Louie's Tux Shop in Carmel, Indiana at Village Park Plaza is conveniently located along US 31 by Marsh and Wal Mart. This location provides tuxedo rental services in Carmel, Indiana for proms and weddings along with wedding invitations, wedding accessories and bridal party gifts. All tuxedos and formal accessories are on display along with formalwear consultants ready to assist your wedding, prom, quinceanera and black tie needs.